The Wayne and William White Engineering Design Centre (EDC) aims to connect students from across the faculty and engage them in interdisciplinary team work. 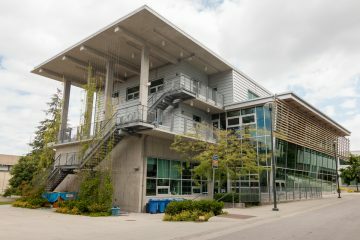 Opened in 2011, the building was made possible through the generous support from UBC Engineering alumni, Wayne and William White. The EDC directly enhances the learning, social, and physical environment of the Faculty of Applied Science community by focusing on hands-on engineering design, project-based learning, and collaborative problem solving. The three-story facility includes a common atrium, classrooms, group and individual study spaces, meeting rooms, student workshops, a dedicated competition space, composites room, and an electronic workroom. The Bay is home to several engineering student design teams that build a variety of projects ranging from cars, to drones, to autonomous robots, to submarines. This space is always filled with students from all branches of engineering, and even some from other faculties, collaborating together to compete in international competitions. Located on the first floor of the EDC, you can take a look into the Bay through the windows in the atrium to see what the teams are working on. The Student Workshop (Room 211) provides trained students with workbenches, hand tools, power tools, and machines to prototype anything they may need for a project. The room also contains whiteboards and 3D printers enabling students to design and rapid prototype their projects. For more information including location, spaces, and booking details please visit the EDC website.